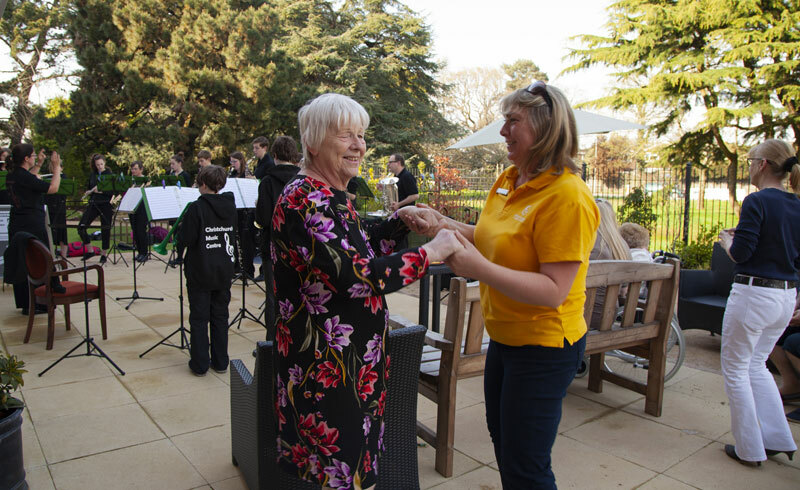 Encore Care Homes > News > Encore News > Encore Care Homes’ activities are given some Oomph! Encore Care Homes’ activities are given some Oomph! Encore Care Homes is delighted to announce its new partnership with OOMPH! starting this month in all three of its homes, which are located in Bournemouth, Christchurch and Fareham. Established in 2011, Oomph! works closely with care and housing services throughout the UK, to support staff and help residents improve their health and fitness, through fun exercises and activities. During the programme residents and staff at Encore will take part in a variety of sport, music, relaxation and nature workshops. One of the key workshops in the project is Oomph! Sport, which aims to make physical activities as fun and beneficial as possible for residents. The training programme involves a variety of chair-based exercises to upbeat music. These exercises will increase the health and wellbeing of Encore’s residents, and are also a great opportunity for those who want to try something new and improve their fitness. Another element of the Oomph! programme is providing in-house activity training and support to the management and staff members of Encore. During this time all staff will create a unique, varied and person-centred programme, which will bring added value to the home. Izzy Nicholls, operations and quality director of Encore Care Homes, said: “We are very much looking forward to starting the Oomph! programme across all three of our homes. Oomph! makes sure that everyone who wants to be involved stays active at a level that they’re comfortable with, whilst having some fun.